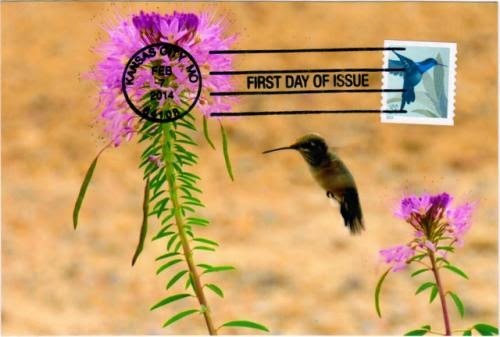 Postcard US-2996988 to Florida was a maxi card of a Rufous hummingbird feeding on flowers of Rocky Mountain Beeplant on Seedskadee National Wildlife Refuge in western Sweetwater County, Wyoming. The stamp was a USPS 34-cent Hummingbird stamp with a first-day-of-issue postmark dated February 7, 2014 in Kansas City, Missouri. Photo from the USFWS Mountain Prairie collection by Tom Koerner/USFWS; used under Creative Commons Attribution 2.0.